You’re reading Back of the Envelope, an experiment that aims to bring shorter, quicker content to FiveThirtyEight. On Friday, New York City recorded its first temperature of 32 degrees or below of the season. As a self-professed weather buff, I thought it felt a little late for the first freeze. Indeed, a look at the climatology records reveals that it was the second-latest first freeze in the past 15 years. 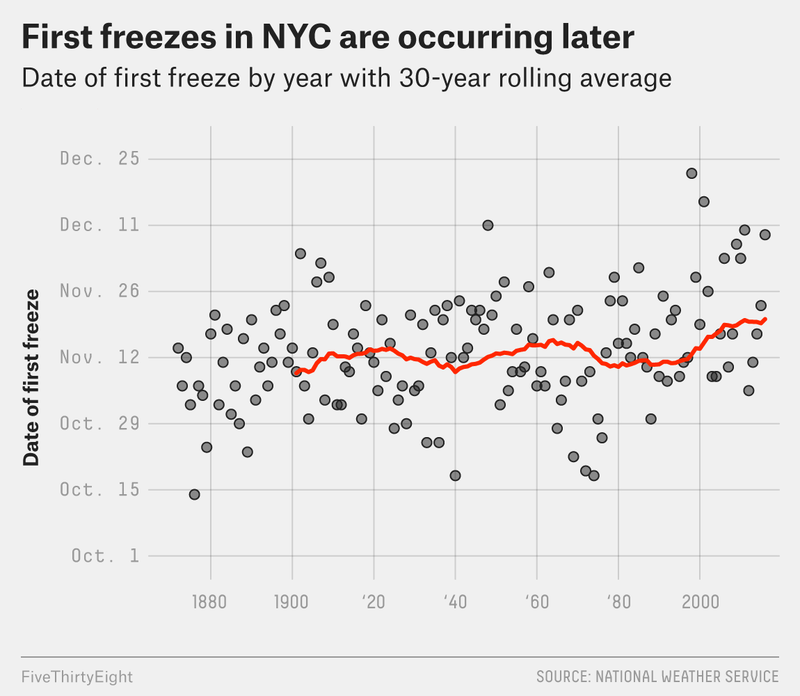 That aligns with the trend we’re seeing: First freezes have been happening later and later in New York City. What we see is that the average date for the first freeze isn’t stable. It was earlier in 1940 than in 1920 and earlier in 1980 than in 1960. Over the past 20 years, though, the average date for the first freeze has climbed toward late November. The line reflecting that rolling average now shows a later freeze date than at any time in more than a century. The first freeze has occurred in December seven times in the past two decades. From 1872 through 1997, the first freeze occurred in December only five times. In every other year during that period, it happened in October or November. Winter also appears to be ending earlier, though that trend is less clear. The 30-year average for the last freeze is about at its earliest point (late March) — earlier than it was a century ago — but the current average is tied with a period in the late 1960s. What’s happening? The trend could be part of a larger change in the climate. We have, indeed, seen temperatures rise globally over the past 30 years. Another possible contributing factor is the urban heat island effect. That’s when urban areas are significantly warmer than surrounding rural areas because concrete and tall structures capture heat during the day and trap it in at night. As New York gets built up more and more, we’d expect temperatures to fall less at night. Whatever the exact cause, the good news for winter lovers is that the lateness of the cold air doesn’t seem to have limited major snowstorms in New York City. New York has had four seasons with at least 50 inches or snow over the past seven seasons; the median yearly snowfall has been just 27 inches since the 1869-70 season. These four seasons of over 50 inches also account for more than half of the 50-inches-plus seasons in the past 50 years. A standard range for averages in climatology. A local regression finds the same thing. The first year of data available on the National Weather Service’s NOWData website. The early date and consistent site — Central Park — for weather observations make New York City a great place to measure trends.